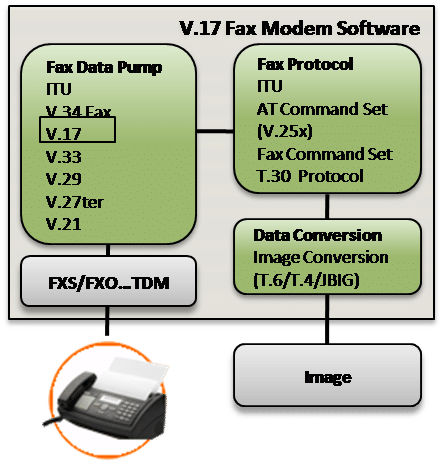 V.17 fax software implements ITU-T V.17 which defines the modulation methods and operating sequences for a modem used solely in high speed facsimile applications. Our V.17 fax source code is optimized for performance on DSP architectures and processors from TI, Intel, ADI, ARM and other vendors. V.17 fax software may be licensed standalone, as a library or a complete design with custom solutions available to meet your unique application requirements. Contact us to discuss your V.17 fax application. The V.17 fax data signaling connect rate is 14.4 kbps, with fallback to slower connect rates of 12 kbps, 9.6 kbps, 7.2 kpbs, 4.8 kbps, and 2.4 kbps for connection over noisy lines. For V.17 fax half duplex operation, the software supports signalling rates of 14.4 kbps, 12kps, 9.6 kbps, 7.2 kpbs, 4.8 kbps synchronous line transmission. The modulation rate is 2400 symbols/second using QAM with synchronous line transmission. V.17 fax training sequences at startup (long train) and synchronization (resync) are used during negotiation to establish the data rate, coding, or additional parameters. The channel carrier frequency operates at 1800 Hz. V.17 includes the use of data scramblers, adaptive equalizers, and trellis coding at rates from 7.2 kbps to 14 kbps. Facsimile service class 2 command sets (T.32, EIA-592 and industry standard facsimile class 2) available. System can be combined with V.34fax facsimile modulations and startup procedures (V.8 and V.8bis). VOCAL’s optimized fax software is available for the following platforms. Please contact us for specific V.17 fax supported platforms.